The Dogwood 'Red Twigged', Cornus 'Baileyi', is a shade tolerant shrub with red bark in winter. 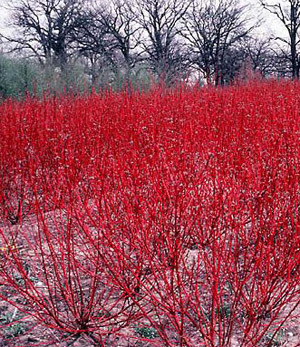 This beautiful red stemmed dogwood has medium green foliage. The creamy white flowers are followed by blue-black fruits. Burgundy colored bark in the winter. It is good for hedge use and winter interest. Needs a sufficient watering routine. Full sun to part shade.